Looking at the horsepower that your machine has is an important aspect to choosing the size of your box plow. To push an 8 foot BOSS box plow, you’ll need a minimum of 45+ horsepower on a skid steer. 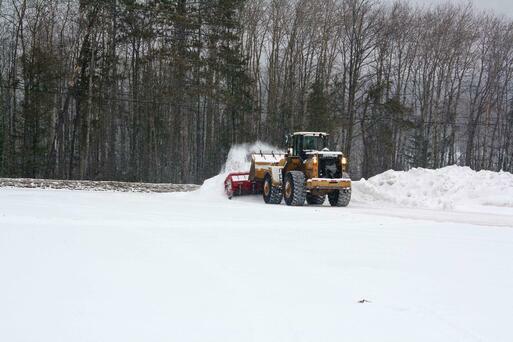 To push some of our larger plows, like the LDR 16 foot box plow, you need a minimum of 170+ horsepower. If you need to push large amounts of heavy, wet snow you are going to need a machine with ample horsepower, such as a backhoe or loader. If the amount of snow your area receives is less of an issue, then a machine with less horsepower, like a skid steer which is typically equipped with ranges of 45 to 70+ HP, may be sufficient for your needs. When mounting a snow plow to your machine, it is important that you never exceed any of your machine operating specs. Pay special attention to your tipping load specification. The tipping load specification is the amount of weight your machine can safely lift into the air without toppling the machine. Most box plows weigh in well below tipping loads; however, it’s always a good idea to double check and confirm with the plow manufacturer. When you purchase a truck plow, one of the main considerations in the plow selection process revolves around the weight and how large the plow is in comparison to how much weight the truck can handle. With box plows, it’s a little different. One of the main factors you should consider before buying a box plow is how much snow you get and the type of snow that typically falls in your area. Because the machines used with box plows are so heavy, getting enough safe traction can be somewhat challenging. That being said, if you get large amounts of heavy, wet snow; although you might think that bigger may be better, this might not be the case.The combination of the limited traction with bigger machines, and the weight of the snow may make this plowing mix somewhat difficult, however, not impossible.To help combat this issue, you could consider adding snow chains on your tires for added traction, although, in many cases they are not an option.You can also look into adding snow tires made specifically for winter use which have better tread and siping. If both of these options are not plausible in your situation, you may want to consider a smaller plow so the weight you are pushing with each pass is reduced. On the other hand, if you tend to get smaller amounts of snow or simply fluffier, lighter snow, a larger machine and plow could be right for your needs. You’ll also need to consider the type of job you’ll need to accomplish with your box plow. Look at the size of the lot and start to list off some of its characteristics. If you have a lot that tends to be more congested with cars or small lanes, no matter how big of a total area it is, you’ll want to consider a smaller box plow to navigate through the small areas. If the lot is big, and generally clear, a bigger box plow may be suitable.The combination of nice, clear lot with a bigger sized box plow means a faster, more efficient plow job and less time on one site. Though, you may want to keep in mind the length of your longest pass and remember the horsepower of your machine and the type of snow you are typically plowing when doing so. If you’ve got a lot of long passes with a lot of wet heavy snow, you’ll need to remember this when picking out equipment. You may want to consider the type of hitch system that your box plow is equipped with. There are two types to look for: a floating hitch or a fixed hitch. A fixed hitch is going to be as its names states, fixed and immobile. A fixed hitch may be sufficient for your needs; however, if you require a cleaner scrape you may want to consider a floating hitch system. All of the box plows offered by BOSS are equipped with a floating hitch as they allow the edge of the plow to follow more closely to uneven pavement, so no matter what the surface, you’re following the contour of the ground. The decision making process before purchasing a box plow may be different than the process of choosing a truck plow, however, at BOSS we make it a little easier by providing a plow selector tool. Use this article as a guide when beginning the search for a box plow and get the final specifications by using the plow selector tool. Once you find a plow, get out there and start pushing that snow!